Moribito: Guardian of the Spirit, by Nahoko Uehashi, is the first book in a ten-book series of which I was completely unaware. 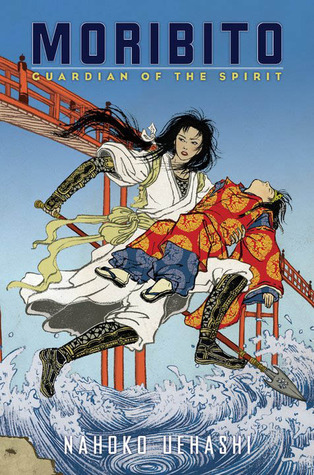 It's set in a fantasy version of medieval Japan and centers on this amazing woman, Balsa, who is the greatest martial artist ever and who works as a bodyguard. Her new charge is Prince Chagum, who has been possessed by a spirit. He is being pursued by people who want to kill him and by some sort of animal who wants to eat the spirit inside him. I am not sure how I first heard about this book, but I assume it was on a blog somewhere. I thought it was a graphic novel, but it's not, though there is gorgeous artwork on not just the cover but throughout the story. I also don't think I realized it was just the first in a long series, of which only the first two books have been translated into English. Hopefully the rest are translated soon! There were a lot of things I really enjoyed about this story. First, it's a fantasy adventure series that features a woman as the hero, which is awesome. Balsa is an amazing fighter who possibly enjoys fighting a little bit too much. She has a slight romantic interest, and that man is a healer who waits patiently for her to return to him, another great example of role reversal. A third very powerful character is an old woman. Again - how awesome is this cast of characters? I love the way Uehashi took what is a fairly common plot - a strong, weary person promised to help a smaller, weaker, but important person to safety - and twisted all of it around to give women and men roles they normally wouldn't get in a fantasy novel. I also LOVED the setting. Loved, loved, loved. Everything felt so real, from the heavy snow in the mountains to the simple recipes. And the way the characters interacted with each other based on class and role was so different than anything I had come across before. It was excellent. Uehashi wrote a novel for children and young adults but within these pages lies a lot of commentary - how facts can be embellished or erased; the power of folklore and stories; and the importance of understanding the truth, and not just listening to what people tell you. That said, the book was not without its flaws. The story did not flow very smoothly. There were multiple worlds existing in the same space, which is a complicated idea to describe, and I don't know if the translator did Uehashi justice. The description of the spirit (actually an egg) that lived inside Chagum and the animal that wanted to eat the egg were also very odd. There were several disparate parts that were all supposed to come cleanly together at the end, but instead, it felt like cutting and pasting and the result was a little haphazard. Hopefully the second book is better translated and easier to follow. BUT, seriously, this book is less than 250 pages with big font and I read it on a rainy afternoon and evening. The negatives above are, in my opinion, outweighed by the characters and the unique setting. Check it out! This sounds fascinating in part because it is so far outside my norm. I'll definitely check it out.